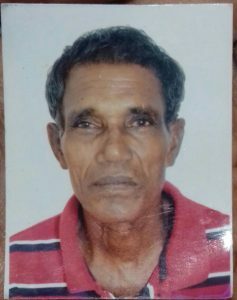 A Corentyne pensioner became Guyana’s latest road fatality victim after he was killed in a hit and run accident on the Tain Corentyne Public road. Dead is Andre Buchan called Nalvan of Lot 51 Block 4, Tain Settlement, Corentyne. According to information received, the accident occurred at around 7 O’clock Sunday night. It was reported that the man was attempting to cross the road when a car slammed into him. The man’s brother, Micheal Latchaya told Demerara Waves that at around 7:30 pm they received news that ‘Nalvan’ was involved in an accident. He stated that upon arriving on scene, they saw him lying in a pool on blood on the public road. “When we got the call, we run out there and we see he lie down, with blood all over he face and he was bleeding out his ears and so”. According to the now dead man’s brother, persons in the area reported that after the car hit his brother, it drove off without eyewitnesses getting a glimpse of the type of car or the licence plate number. “They say they didn’t see nothing since it was dark. All they see is a car hitting him and that’s it”. Family members are hoping that the police make some headway in their investigations to apprehend the perpetrator.